We had a our first leg of Halloween dressing-up last Friday for a homeschooler's Halloween party. Now normally, we make, sew or otherwise design our own costumes. However, when the kids stumbled on a $10 Emily The Strange costume at our local thrift shop, (and since she's a huge fan), well, she had to have it. I'm so glad, too, because she made a wicked cool Emily. See for yourself. Of course this meant that the window was open for Adam to buy a costume as well. And that was okay with us, especially since he wanted to be The Dark Knight Batman (and no, none of us have seen the movie, he just likes Batman.) I mean, we sew, Alex has cranked out ball gowns before, and I can put together a pretty sweet costume myself, but did I want to be sewing muscles and six-pack abs? Nope. Works for me. I did add a little stage make-up to his wee cleft chin to make him look more superhero-chinned. I think he made a pretty great Batman. Here's Batman with his friend the Mummy. The kids also made these really fun cookies for the party. 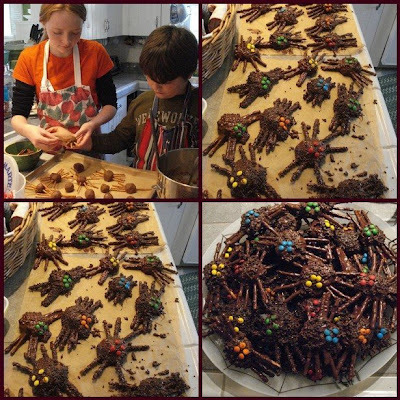 They were messy to make, but they seemed to be a hit. So the second leg begins Thursday when we carve our pumpkins while watching The Nightmare Before Christmas. Friday, Samhain, we'll dress-up again, and join friends at a party while the kids terrorize the neighborhood. Tonight we watch Beetleuice. Enjoy your Halloween Everyone! i bet they taste great but they still are scary! Your daughter makes a perfect Emily and the superhero chin made the costume just right! Happy Spooky Samhain to you! Cute costumes! And yum on those treats!